Did you happen to catch our Mama's Jewelry promotion for Mother's Day? We were sharing a special offer and learning about their beautiful custom rings. (Thanks to US Family Guide.) Mama's Jewelry has been designing jewelry for over 30 years. They have mastered the art to bring us beautiful pieces at affordable prices. They enjoy what they do and will take care of you, they offer fast turnaround times, too. Which is perfect for last minute shoppers, yet their pieces are custom pieces that look like it took months to prepare. I got to sample their custom jewelry first hand. We went with this gorgeous necklace above. 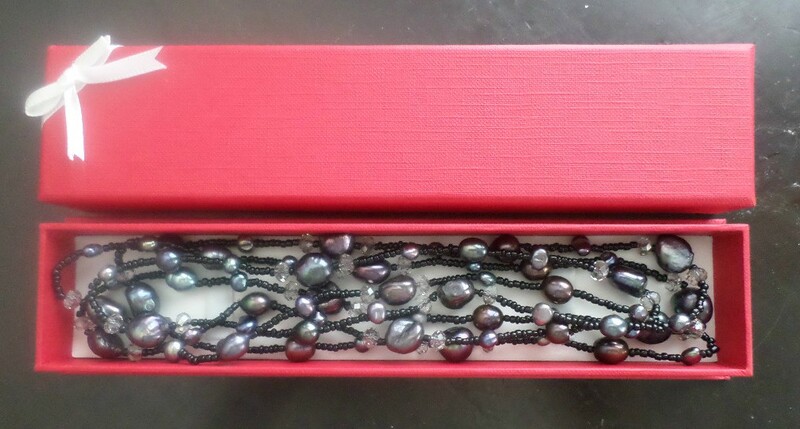 Packaged beautifully in a red box, with good quality heavy beading (but not too heavy). This lovely piece is versatile and could also be a beautiful bracelet. Perfect for gift giving. Treat your special lady to many custom designs.